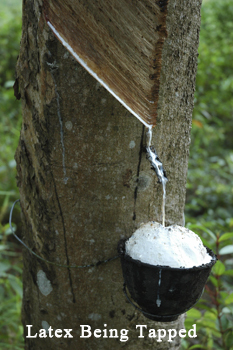 Organic latex is a natural and renewable resource that is tapped from living, organically grown, rubber trees. 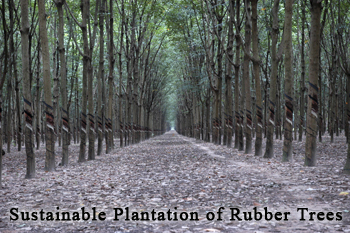 The trees are grown in Asian plantations for the specific purpose of producing natural and organic latex. and they live-out their natural lifespans while doing so. The Global Organic Latex Standard (GOLS) organic certification ensures that rubber plantations as well as processing units up to the final retailer are certified according to the organic standard. All natural latex is processed under one of two methods of production. The dunlop method is the original way latex was invented, and is the only type of natural rubber latex that can have organic certification. Dunlop latex is a closed-cell foam with high-density. The talalay method of production uses more technology, and produces a softer and more lively-feeling foam. Although it cannot have organic certification at this time, VITA talalay made by Radium Foam is arguably just as pure as latex made by the dunlop method. The talalay process produces an open-cell foam with less density than dunlop. Because the production is more involved, talalay latex usually has a higher price than dunlop latex. But a shopper must take care. The term “latex” is nearly meaningless. But some companies will use the term latex because their foam is the less expensive and lower performing synthetic latex. Some companies also blend natural rubber latex with synthetic latex ingredients to help lower the cost. So be wary if only the word “latex” is used. Even the phrase “natural latex” only means that the foam mattress contains at least 60% natural ingredients. And the “natural” part may include inexpensive fillers such as chalk, clay and ash. So look for the phrase “natural rubber latex” or “organic latex”. These specific phrases, when used correctly, mean that the foam will not contain any synthetics, fillers or blends. At ECO Sleep Solutions of Eugene, Oregon, our brands only use organic latex. This means they are as gentle on Mother Earth as they are healthy for you.